Baked in a spring-form pan, this nut-crusted, open-faced pie is as easy to make as it is delicious. 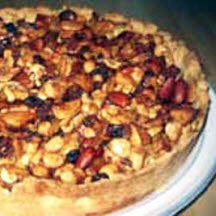 For Nut Pastry: In medium bowl with electric mixer, beat together butter and sugar until blended. Add flour, nuts and vanilla, mixing just until combined. Form dough into a ball; refrigerate if not using immediately. Prepare Nut Pastry. Pat pastry into bottom and 1 inch up sides of 9-inch springform pan. Bake 10 minutes. In large bowl, combine apples, raisins, nuts, applesauce, sugar, flour, cinnamon, and salt. Transfer mixture to pastry-lined pan. Bake 40 to 45 minutes or until apples are tender. Serve warm. Nutritional Information Per Serving (1/10 of recipe): Protein: 4g; Fat: 15g; Carbohydrate: 49g; Fiber: 3g; Sodium: 134mg; Cholesterol: 25mg; Calories: 333. Recipe and photograph courtesy of the Washington Apple Commission.